Barcelona is one of the most beautiful cities in Europe and the Mediterranean. The city has plenty to offer for a shore excursion to enjoy a nice day trip from the cruise ship. Either on your own or with our tours. From the Cruise ship to Barcelona for a day: In Barcelona you can spend the day in a variety of ways. 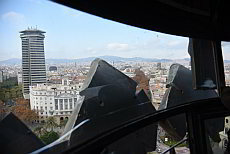 The convertible bus is perfect for exploring Barcelona on your own during a shore excursion: two lines (three in the summer) will take you to almost all of the city's sights. It is very easy and cheap. You can get on and off at more than 40 stops at will and also change between the lines. 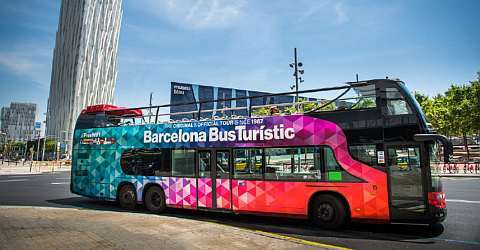 All you need is a 1-day ticket for the Turístic Bus, as the Hop on Hop-off bus in Barcelona is officially called. The pure driving time of the year-round operated red and blue line is approximately 2-2.5 hours. With roundtrip to the cruise port and having a look at some attractions it is perfect for a land stay from about five hours onward. From the port, you can easily reach the Turístic Bus with the T3 (PortBús) shuttle bus. The red line will take you directly to the terminus of Portbús, just steps away from the Columbus Monument, and your shore excursion can begin. Especially comfortable is a shore excursion with a Private City Sightseeing Tour. 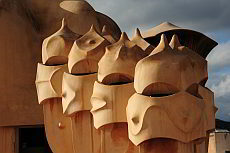 During our 3, 4 or 8 hour Private City Tour we will show you the highlights of Barcelona. We are also happy to consider your interests and show you the most beautiful sights and also places away from tourism. On our City Tours, you have the opportunity to stretch your legs and enjoy the view of the city. On request, you can enjoy a Tapas Break in a very nice restaurant. At the end of the Private City Tour, we bring you back to your cruise ship or to a point of interest, where you can then continue the shore excursion individually. In this case, you can return to the ship by public transport or by taxi. Directly from the end of Portbús starts the old town and the Ramblas, which are ideal for a stroll through the city. The old quarter Barri Gòtic, which is located on the right side of the Ramblas, is an ideal place for a stroll during the shore excursion. Here you will experience 2,000 years of history since Roman settlement. The mighty city walls are still to admire today, but also a lot of shops, museums, bars and restaurants attract the guests for a walk. With our city tours in the Gothic Quarter and the city tours in the Raval district you will learn a lot about Barcelona. Both start near the PortBús stop. Visit of the Palau de la Música followed by a tour to the most beautiful buildings of Modernism, the Catalan Art Nouveau style. Santa Maria del Mar - You may know the church from the bestselling novel "The Cathedral of the Sea"
With a guided Bike Tour we show you the most beautiful sights of the city. Also available as a private tour, you can choose the date and time of your choice. The bike tours take 2.5 to 4 hours. On your own with the rental bike. For example, just along the coast. Of course, a shore excursion of 5 to 8 hours is not enough to see everything worth seeing. Here we have a small selection of the most important buildings and attractions: These should be on your shortlist if you want to see and discover Barcelona on your own. You can choose two or three of them for your trip. 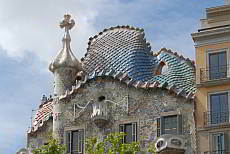 Casa Batlló is one of the most important and famous buildings of the architect Antoni Gaudí. The visit is easy, as this top attraction is located on two lines of the Bus Turístic. 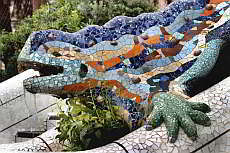 For the visit of the Casa Batlló you should plan 1-1.5 hours. Just one stop from Casa Batlló is Casa Milà, another masterpiece by Gaudí. It is also on the UNESCO World Heritage List. For the Casa Milà you should plan 1-1.5 hours. The Sagrada Familia is certainly one of Barcelona's most impressive sights. If you start your morning sightseeing tour, you can join our tour of the façade at 2:00 pm and enter the church. 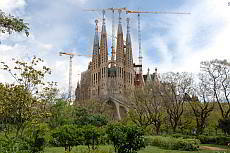 For the Sagrada Familia you should plan about 2-2.5 hours including the guide. 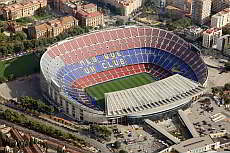 Visit Camp Nou, the stadium of FC Barcelona. Even non-football fans will be impressed. The largest football stadium in Europe is located directly on the blue line of the Bus Turístic. You do not have to set your time with our tickets. For the Camp Nou you should plan about 1.5 hours. Montjuïc and Telefèric: this mountain is located between the city and the port of goods. From the top you have a wonderful view over Barcelona and the harbor. 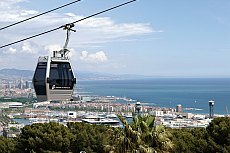 With the cable car Telefèric, which starts at the bus station of the same name, you can easily reach the top. For the Montjuïc you should plan incl. Telefèric approx. 1.5-2 hours. The observation tower of the Columbus Memorial at the beginning / end of the red line is a good introduction to your shore excursion. For the tower you should plan about 30 minutes. The Park Güell is beautiful. Around 80% of the park can be visited without entry ticket. We can end our City Sightseeing Ttour there and have a look at this UNESCO monument in peace (about 1-1.5 hours, drive to the ship by taxi or public transport). Advance booking for the Monumental Zone is required. 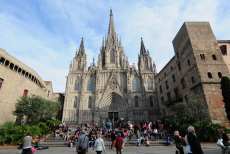 You may know the church of Santa Maria del Mar from the bestselling novel "The Cathedral of the Sea". For the visit of the church you should plan about 1 hour. In this quarter - also known as Barri Gòtic - Barcelona has its historical origins: the Romans founded Barcino here. 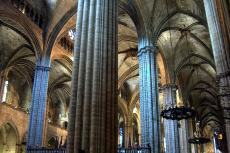 Of course, you will find many Gothic buildings, as well as the largest Roman excavations outside Rome. The tour of the Gothic Quarter takes about 2-2.5 hours.